BIOM is a pilot project aiming to develop a renewable, biodegradable material that can replace oil-based plastic. Previous prototypes lacked logistical infrastructure at the collection stage and the material was only biodegradable in industrial compost. 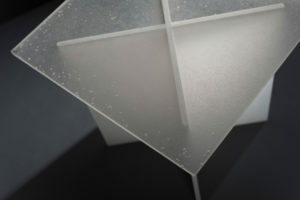 The novelty of this 2nd generation material is its revolutionary ability to be home-composted. The ground-laying activity includes the development of a granulate from a new material mixture with the required stability and temperature resistance. An automated production process (pressing, injection molding) is established in order to produce intermediate sheets needed for the design objectives and material data-sheets. Two other main activities are based on designing final products: glasses and cups. crafting plastics! 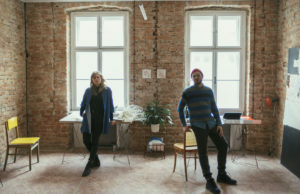 studio was founded by product designer Vlasta Kubušová and production designer Miroslav Král. They experiment, produce and collaborate, while having the whole product's lifecycle in mind. 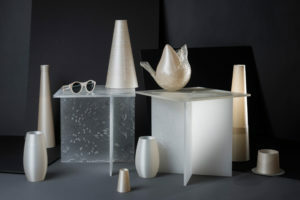 By realising dynamic research and innovation in bioplastics and design, they provide a solid and innovative base for interdisciplinary progress towards enjoyable sustainability and more transparent production. They explore new ways of developing products, from basic craft approaches to high-tech machinery. The company Panara was established in 2001 as a production and trading company of PE plastics films. Since 2006 the company entered the bioplastics area, with the goal of developing biodegradable, bio-based blends for different types of plastic processing. 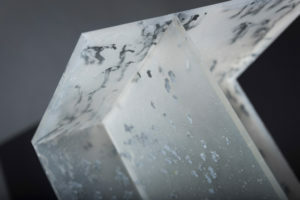 They hold a strong partnership with the Slovak University of Technology via the unique CEPOMA (Center for Applied Research of environmentally friendly polymeric materials). How did you join the OpenMaker project? Our network - consisting of designers, researchers and entrepreneurs - fosters an innovative environment where open source, collaborative practices and community spirits are emphasised. A fellow maker, who was also applying to the call, told us about this opportunity and we thought we could use OpenMaker to help us bring our collaboration with Panara to next level. But the deadline was kind of behind the corner already. So during a few very intensive days, we had put together all necessary paperwork (which fortunately was not the usual, exhausting amount of bureaucracy – thanks for that). Now that we have been accepted into the acceleration programme for BIOM, we - the team of cp!s - are looking forward to contributing to the values of OpenMaker within our scope of work! As a designer studio, we have approached manufacturers on many occasions already, and one of the biggest challenges was that usually as a maker you want to do small samples to find out if your ideas work, but manufacturers have this huge minimal orders, which are usually too expensive for a maker to pay. So you have to be lucky enough to find a manufacturer which loves her or his job enough to take the time to experiment with you. If this happens, the partnership can be mutually beneficial in many ways – makers can inspire manufacturers to innovate in a way that they maybe thought was never possible. Makers can take risky decisions on their own, or change directions pretty swiftly when needed . The manufacturer, on the other hand, can provide very much needed scientific, technical and know-how support. Small makers could never afford to buy those expensive machines and learn how to operate them, even when they strictly need them to accomplish their projects. Dream big! What would be your greatest achievements and main challenges? In the long run, our dream is for petrol-based plastics to disappear completely. In the next couple of years, we will work hard on introducing a new generation of bioplastics into various industries. The biggest challenge is to let the world know that we are here... that there is already a reasonable alternative to conventional plastics. It is hard to be heard in a world of “big players” who are in the position to push into market even with half-baked solutions. Also it is very important to build reverse-logistic structures and circular business models in order to unfold the entire impact of bio-based and degradable polymers. We would like to inspire the EU to invest more energy in stronger policies supporting biodegradable solutions that can replace conventional plastics. What do you expect from the OpenMaker experience? What we hope for is to lay firm foundations for the long term collaboration between Panara as the manufacturer and cp!s, as their innovative designer partner. This will also help Panara to expand its production, set up its production processes and prepare the ground for the further development of our businesses with intermediates and final products made from our new material. Marketing biodegradable intermediates is a crucial step towards our expansion into more industries. It's a small, weird bio-world that you live in ...? During the preparation of our promotional video shooting, the director was flying from Berlin to Bratislava with a bag full of weird props – all kinds of heads and bodies of plastics dolls, bathtub ducks, squeaking plastics toys for dogs and so on. After arrival to our office, we have found out, he had accidentally picked up the wrong bag at the airport. We were terrified not to be able to shoot the next day, if we didn’t get the props back. Also, we had a bag with the personal possessions of some stranger. Fortunately, the stranger had his phone number somewhere in the bag, so we managed to call him. It turned out, the stranger was still in town, so he came to our office. The strangest part was that he is actually a part of a NGO Biomimicry Germany, so we had a lot to talk about and discussed how we apply natural principles to our work.